Digital Book World has always leaned more towards the corporate side of book publishing, but next year's conference is going to shake things up a bit. 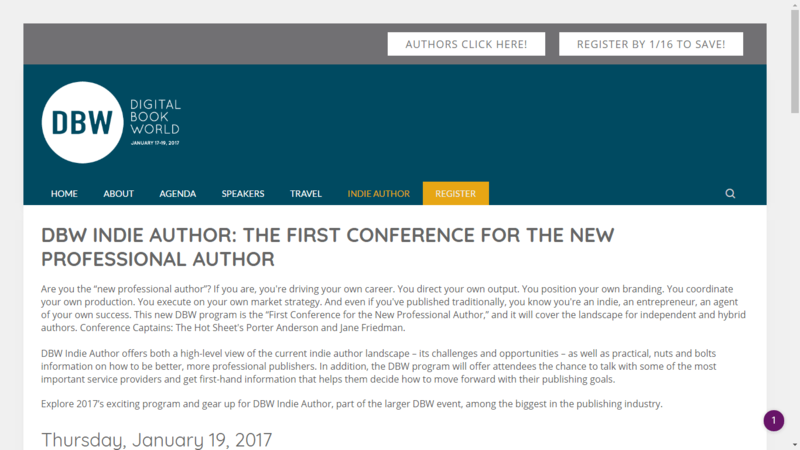 I was browsing the DBW conference website this weekend, planning my trip, when I noticed that they had added a track focused on indie authors. Are you the “new professional author”? If you are, you're driving your own career. You direct your own output. You position your own branding. You coordinate your own production. You execute on your own market strategy. And even if you've published traditionally, you know you're an indie, an entrepreneur, an agent of your own success. This new DBW program is the “First Conference for the New Professional Author,” and it will cover the landscape for independent and hybrid authors. Conference Captains: The Hot Sheet's Porter Anderson and Jane Friedman. DBW Indie Author offers both a high-level view of the current indie author landscape – its challenges and opportunities – as well as practical, nuts and bolts information on how to be better, more professional publishers. In addition, the DBW program will offer attendees the chance to talk with some of the most important service providers and get first-hand information that helps them decide how to move forward with their publishing goals. This track runs on Thursday, 17 January, and in some ways it duplicates the F+W Media's Writer's Digest Conference (which is held in August in NYC). It's hard to say how they differ, though, given that I have attended one but not the other. But we can tell from the schedule that one way they differ is that the Writer's Digest Conference spans several days, and is more comprehensive, than the one-day indie author track at the DBW conference. If you have limited funds this year I would recommend attending the Writer's Digest Conference. Based on what I saw last year, I think that conference is worth the time and expense. Whether the new DBW conference is worth the investment remains to be seen. DBW makes their money off $1,500 conference tickets. After all, DBW’s indie track is being run is Porter Anderson, whose own consulting business to publishers is sputtering. Hella funny to see him now rattling the cup hoping for a few pennies from the very same indie authors that he patronized so smugly for years. It is a money grab, yes. I inquired about the “working lunch”, thinking I could contribute by talking about websites or talking to bloggers. Nope; that event is strictly for sponsors advertisers, rather than what the attendees might need. Can’t blame them for trying to hustle the industry’s new money indies, now that the old money has dried up. But it’s a lost ’cause for DBW… It’s too late for them to pivot and become the “AuthorSolutions” of industry conferences, no matter how hard they wish they could. Especially not when a different part of F+W already offers an author conference for a great value.